It was a festive Saturday morning in Cebu City. The entire province is celebrating its annual Sinulog Festival. But instead of joining the fun there, me and 11 others is on a trip going to the other side of Cebu, the town Balamban. Our purpose is more that just vacation, we will also do volunteer work. 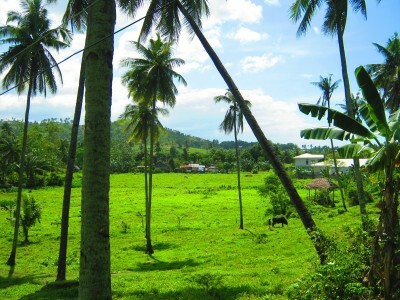 Balamban is at the feet of the mountains and beside the sea. How to get to Balamban? Going to Balamban from Cebu City is quite easy. All you need to do is to ride a GT Express van in Ayala Center PUV terminal. It will traverse the island via the Transcentral Highway. The fare is 110 Pesos and the travel time is approximately one hour. In our case, we left Ayala at around 10 o'clock in the morning and after an hour, we reached Balamban Proper. The Transcentral Highway stretches from Lahug to Balamban Proper. The highway cuts the island of Cebu into two. 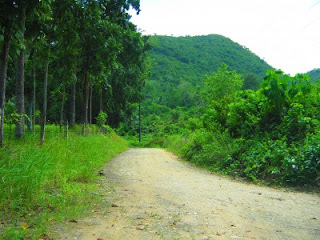 It passes over the tip of the island's mountainous region. The road is wide but because of altitude, it is usually foggy, hence, poor visibility. Motorists traveling in that road are advised to take extra precaution. There are also portions of the highway where both sides are deep ravines. Red warning marks can be seen as soon as you pass Ayala Heights, a subdivision in highland Cebu. Drivers are also warned to observe specific speed limits. But since GT Express drivers were already experts in driving that kind of terrain, the risk, you may say, is already minimized though it is still advisable to be careful. Traveling in the Transcentral Highway is fun. The views are fantastic. Green lushes surrounds you and low-lying clouds is magnificent. There are few establishments along the Transcentral stretch like as restaurants and bars. Vegetable and flower plantations are common. I think it's the main livelihood of most people living the area. 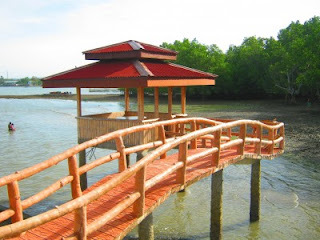 We planned a two-day trip and we chose Costa Roca resort as the place to stay. The place was nice overall. The beach is not attractive though. Trees and bushes are still in the shore line. The shore is dark and rough because of stones and mangrove sprouts. But the beauty of the resort comes from the well- maintained swimming pool and causeways that stretch a few meters to the sea. At the end of the each causeway, there's a hut where you can eat, relax, and sleep. 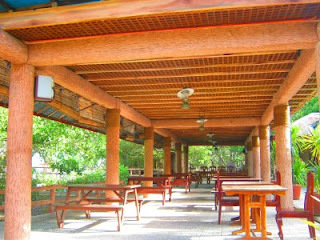 Costa Roca has a restaurant for those who wants to eat inside the resort. They serve native cuisines such as humba, mixed vegetables, and pancit. In our case, we ate lunch in the first day in the restaurant but for the rest of the trip, we decided to cook food for ourselves. It was allowed by the management as long as you have your own equipment. Costa Roca also offers rooms good for two persons for a very cheap rate. If you decide to add a bed, you just have to add a little more to the price. The room that we got is the cheapest but it can be occupied by up to 4 persons using two double decks. It was air-conditioned, clean, and has a common rest room for the rest of the guests in the same room type. The good thing though is, at that time, we are the only ones occupying the cheap rooms. The pool is well-maintained and can be until to 11 o'clock in the evening. The reason for that is that the pool cannot be used without the official lifeguard. And he is available until 11PM only. So after a long first day of volunteer work, we cooked, ate our dinner and went to the pool afterwards. Because of our insistence, we were able to request another hour and finished swimming around 12AM. The next morning, we packed our things, checked-out of Costa Roca, and did the second and final day of our volunteer work. By noon time, we ate our lunch in Karne Grill in the new Gaisano Mall. We then continued the last part of our work and went back to Cebu city at around 3PM. 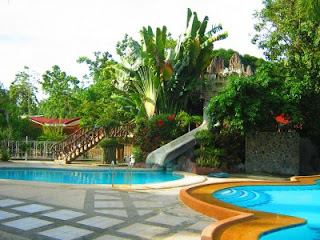 Even though our stay in Balamban was very short, we certainly enjoyed it. 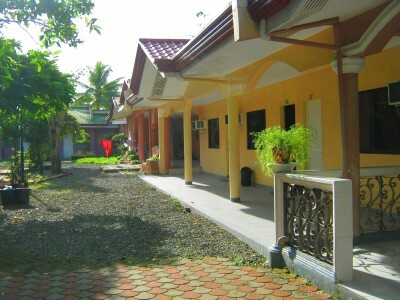 While working in the area, we found that life in Balamban is much more simpler and quiet. So if you want to have a break from your repetitive routines, go to Balamban.